What is Trifexis® (spinosad + milbemycin oxime)? 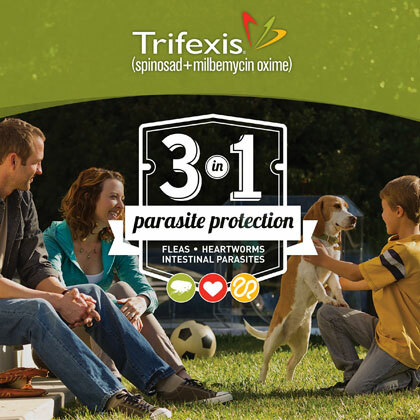 Trifexis is a chewable tablet that kills fleas and prevents infestations, protects against heartworms, and treats and controls adult hookworm, roundworm, and whipworm infections. 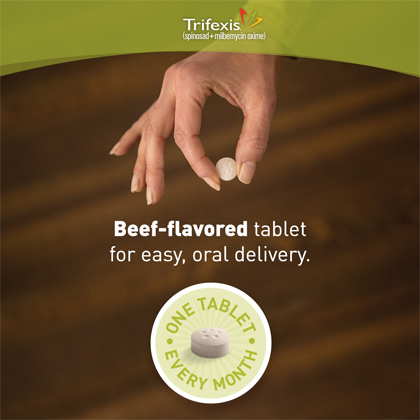 This tasty, beef-flavored tablet is easy to give your dog to protect against multiple parasites with one medication. 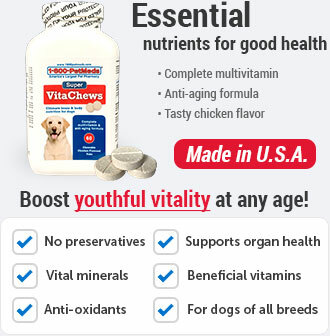 Trifexis chewable tablets are for monthly use in dogs and puppies 8 weeks of age and older and 5 lbs of body weight or more. Trifexis requires a prescription from your veterinarian. 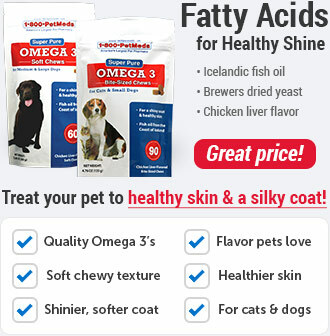 Provides 3-in-1 parasite protection against heartworm, fleas, and intestinal parasites. 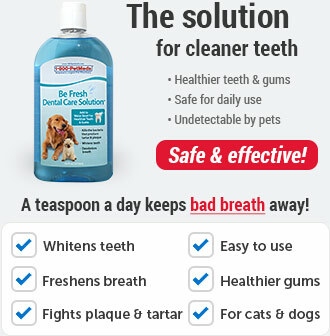 Spinosad, an active ingredient in Trifexis, starts to work within 30 minutes to kill fleas and has been proven to kill 100% of all biting fleas within 4 hours. 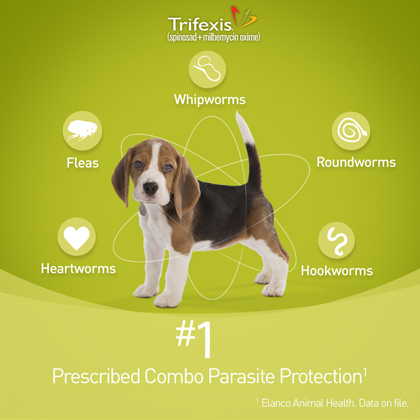 Trifexis prevents heartworm disease by killing microfilariae and larvae from maturing into adult heartworms. Serious adverse reactions have been reported following concomitant extra-label use of ivermectin with spinosad alone, one of the components of Trifexis chewable tablets. Treatment with fewer than three monthly doses after the last exposure to mosquitoes may not provide complete heartworm prevention. Prior to administration, dogs should be tested for existing heartworm infection. Use with caution in breeding females. The safe use of Trifexis in breeding males has not been evaluated. Use with caution in dogs with pre-existing epilepsy. Puppies less than 14 weeks of age may experience a higher rate of vomiting. Consult your veterinarian for pregnant or lactating dogs. What is the most important thing I should know about Trifexis? Trifexis is a prescription medication FDA approved for use in dogs 8 weeks of age or older and 5 lbs of body weight or more. 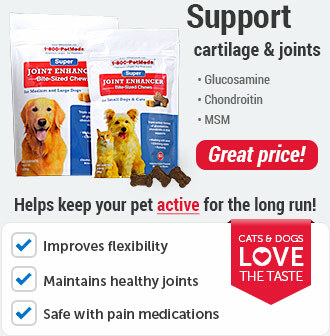 Trifexis contains spinosad and milbemycin oxime and is indicated for the prevention of heartworm disease. 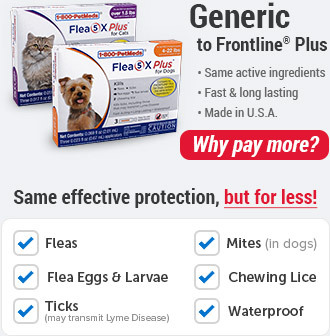 Trifexis kills fleas and is indicated for the prevention and treatment of flea infestations, and the treatment and control of adult hookworm, adult roundworm, and adult whipworm infections. 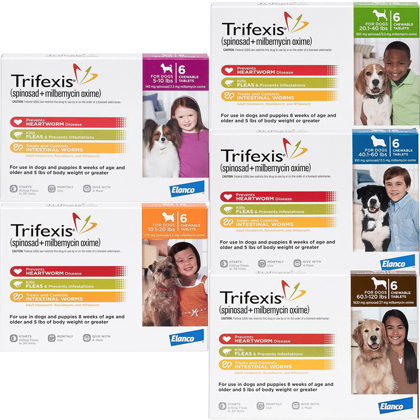 Trifexis is available in a Pink box for dogs 5 to 10 lbs (140 mg/2.3 mg), Orange box for dogs 10.1 to 20 lbs (270 mg/4.5 mg), Green box for dogs 20.1 to 40 lbs (560 mg/9.3 mg), Blue box for dogs 40.1 to 60 lbs (810 mg/13.5 mg), and Brown box for dogs 60.1 to 120 lbs (1620 mg/27 mg). For dogs over 120 lbs, give the appropriate combination of tablets. See Trifexis label for complete safety information. What should I discuss with my veterinarian before giving Trifexis to my pet? How should Trifexis be given? Give Trifexis chewable tablets once a month with food. Trifexis chewable tablets may be chewed, offered in food, or administered like other tablet medications. If vomiting occurs within 1 hour of administration, redose your pet with another full dose. Consult your veterinarian for pregnant or lactating dogs. What are the potential side effects of Trifexis? Side effects that may occur include vomiting. If vomiting occurs within one hour of administration, redose with another full dose. Other side effects may occur. Continue giving Trifexis chewable tablets and talk to your veterinarian if your pet experiences decreased appetite, lethargy or decreased activity, diarrhea, cough, increased thirst, vocalization, increased appetite, itching, hyperactivity. 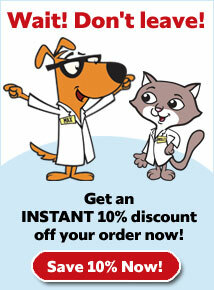 Talk to your veterinarian about any side effect that seems unusual or especially bothersome to your pet. The use of ivermectin at higher than FDA-approved doses at the same time as Trifexis can result in serious side effects. What happens if I miss giving a dose of Trifexis? What happens if I overdose my pet on Trifexis? What should I avoid while giving Trifexis to my pet? Your pet may maintain normal activities and interactions while being given Trifexis. The safe use of Trifexis chewable tablets in male dogs intended for breeding has not been established. What other drugs will affect Trifexis? Store Trifexis at room temperature (68°-77° F). Keep out of the reach of children.